Click Map of Ancient Rome for a “FREE” download of this page in PDF format. In 753 BC, when Rome was founded, the area in the center of the seven hills was a swamp because the water from the springs in the nearby hills drained down into it. Soon, the Etruscans, a more advanced society from the north, merged with the Romans and the other tribes of the seven hills. In order to bring the tribes together, the Etruscans worked with the Romans and taught them how to build sewer lines that would drain the swamp water down to the Tiber River. One of these sewer lines, the Cloaca Maxima, is still in use today. The historical record states that it was built around 600 BC. Once they were able to keep it dry, the Etruscans turned the area into a meeting and market place which became the Roman Forum. In 44 BC, Julius Caesar was assassinated shortly after he walked into Pompey’s Hall. Mark Antony gave his funeral oration for Caesar while standing on the rostra at the west end of the Forum. A funeral pyre was built for Caesar after Antony’s oration, and later Octavian initiated the construction of a temple on site of the pyre. The remains of this temple’s altar still stand in the Forum today, and current day Romans still leave flowers there in memory of Julius Caesar. In the time of Augustus, his best friend and military commander, Marcus Agrippa, took on the task of cleaning the sewers. He was not satisfied until he could personally sail through them from the Forum down to the Tiber. Agrippa also built the original Pantheon in 27 BC. Unfortunately, it was destroyed in the great fire of 80 AD. It was rebuilt but burned down again in another great fire in 110 AD. The emperor Hadrian had it rebuilt in the early part of the second century AD and had Agrippa’s name inscribed on its front face in honor of him. It was completed in 127 AD and stands intact today as one of Ancient Rome’s finest and most beautiful buildings. Rome, like many cities, was founded at a bend in a river which made the crossing of it somewhat easier. 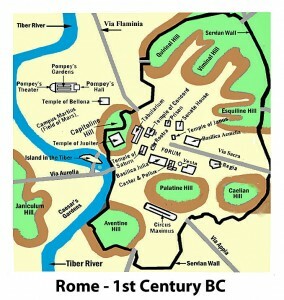 The legend is that the brothers, Romulus and Remus founded Rome on the Palatine Hill in 753 BC. They immediately entered into struggle for power and engaged in a fight in which Romulus slew Remus. Romulus became Rome’s first king. The legend is that Rome was named after him.